Providing some simple astrological remedies for manglik people, how to get married early for manglik people, how to get rid of mangal dosh. Mangal dosh hona ek bohot badi samsya mani jati hai, darsal aisa nai hai. Agar aapko bhi mangal dosh hai to kuch khas upay se aap chutkara paa sakte hai, us se hone wali pareshaniyo se. aayiye jante hai astro uncle se. If the place of Mars is on first, second, fourth, seventh, eighth and twelfth place then child can be considered as manglik. Duet to Mars marriage becomes late. It also creates problems in married life. It is not problem of become manglik but if there is mangal dosh then you should take some measures. If there is netting of lines on Venus, it has black or red spot then a person has mangal dosh. People who have this, there marriage becomes late or they might have problems in their married life. If such line comes from Mars Mountain and goes to Venus then a person has mangal dosh and so he should take some measures. If such lines come downward from heart line then there must be problem in love marriage or engagement due to mars. There must be problem in child’s birth due to mangal dosh. Due to mangal dosh skin becomes dry, level of protein increase or decrease, hair fall. There are also small spots on face, symptom on body shows mangal dosh. There is also swelling under the eyes due to mangal dosh. 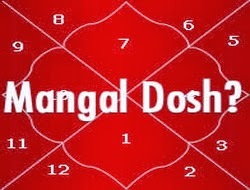 A person has problems relating to blood or skin due to mangal dosh. You should do ordinary measures. You should change your habitual. You should take measures when a child reaches to the age of marriage. Wear less red clothes. You can tie red string. You should worship Lord Hanuman. You should help poor children; donate sweets to poor workers on Tuesday. Take red lentil and jaggery and feed it to cow on Tuesday. You should control on your anger and blood pressure. You should do converse. You should wear more copper and less gold. Avoid such food which increases fallibility in blood. You should concentrate on your food habits. Serve banana and banyan trees. You can do “Om Gam Ganpataye Namah” or worship Lord Ganesh. You should feed three dogs regularly. You can also do puja for mangal dosh in month of Shravan at Ujjain. You can also do “Om Ham Hanumataye Namah”. Change your habitual.